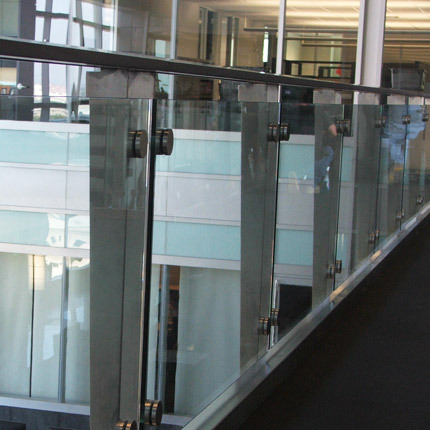 SIMO RAIL is a stainless steel and glass handrail system designed as a beautiful and practical product for high end commercial projects. 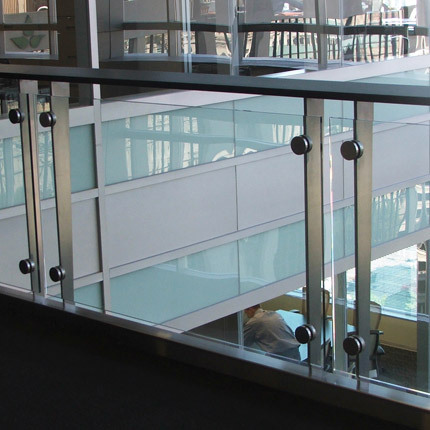 The SIMO RAIL pleases the eye with smooth lines and clean stainless steel circular attachment points that secure and center the ½” thick clear tempered glass. The unique ½” thick tapered stainless steel water jet cut post design offers our customers an architectural look, while providing the strength necessary for high traffic spaces. This product is also available to be customized with both the metal and glass panels. The posts can be changed to ¾” thick tapered aluminum bar posts and the glass infill panels can be almost anything you can dream up.